Tenerife is the largest of the Canary Islands and it is a popular place to visit. It is particularly popular with British and German tourists, although visitors come from around the world. The island has beautiful beaches and a very active nightlife. There is also a large amount of natural beauty including lush forests and beautiful mountains. 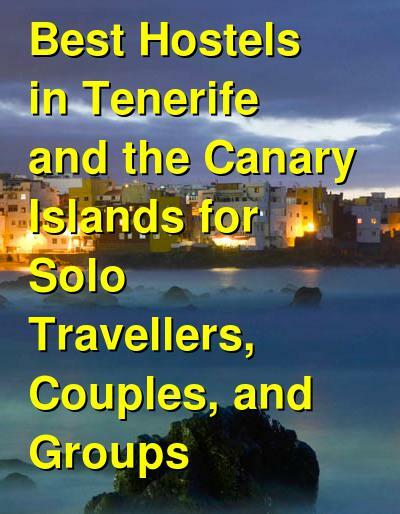 There are some great hostels in Tenerife. Many hostels are small and have a very personal feel. Whether you're traveling alone, as a couple, or as part of a group, there are a number of good hostels to choose from in the area. A good hostel for solo travellers, groups, and backpackers. Hostel Tenerife is a hostel that's designed specifically for backpackers. It's located in a 100 year old Canarian house that has a welcoming and cozy atmosphere. There are six rooms to choose from including two dorms that have four beds each, three twin rooms, and one single room. The hostel is located right in the middle of La Orotava, which is one of the most quaint towns in the area. In the surrounding area you'll find many great bars and restaurants that serve local food and dishes. It's slightly removed from the mass tourism scene but is still close to many popular beaches and surfing areas. El Socorro is about ten minutes away by car, twenty minutes by bus. There are several great common spaces in the hostel. There's a roof terrace, a living room, and a shared kitchen that guests can use. There are also two grocery stores nearby where you can pick up some food and supplies. The hostel is owned by an Austrian who loves to travel, so he can help you with any questions you might have. He also acts as a hiking guide and can help you arrange any number of excursions around the area for a discount. If you're traveling with a group, it's possible to book the entire hostel for a minimum stay of a week. A good hostel for couples and solo travellers. La Tortuga Hostel is located in Plaza del Duque. It's a relaxed and peaceful place to stay that has four bedrooms spread out over two floors. There are twin, double, and four bed dorms available. There are also three bathrooms, a shared kitchen, a separate dining area, and a large lounge with a television. Free wi-fi is also available throughout the hostel and breakfast is served every morning. If you want to spend some time outdoors, there's a relaxing garden, a small pool, and a covered terrace. There's also a barbecue area. The hostel staff can help you organize any number of activities. Kayaking, snorkeling, diving, and canyoning trips are all available. Tours are done through affordable and reputable companies. This hostel is a little set back from the main touristy areas but you can still reach Las Americas and Costa Adeje by bus, bike, or even a long walk. Los Amigos Backpackers Hostel is a popular hostel in Tenerife that is run by backpackers for backpackers. It's located in a quaint villa that has a garden, pool, and a barbecue area. It's also just 200 meters from the beach and easily accessible from the airport. The area has beautiful beaches and a great natural setting. It's also close to the main commercial part of town. Los Amigos has all of the standard amenities including a free buffet breakfast, wi-fi throughout, and plenty of storage space for you bicycle and surfing gear. There are lockers available if you're staying in dorms. This hostel is run by travelers for travelers. They know what you need in a home away from home and they work hard to make sure it's available here. This is a fun and relaxing place to stay. There are double private rooms available as well as four, six, and ten bed dorms. There's also a tent that guests can rent. El Poris is a nice villa in Tenerife that is relaxing and fun. They have space for just ten people so it has a very personal feel with high quality amenities. The hostel is close to the beach on the south side of town. It's about fifteen minutes from the south airport and is in the small fishing village of El Poris. There's a supermarket, post office, pharmacy, and bank nearby. There are also bars and restaurants that are open daily and a nice farmers market that's held every Sunday morning. The hostel has free wi-fi, a dvd collection, and two kitchens. There's also a living room, pool, a large garden, a pool table, and plenty of different activities for guests. The hostel has twin, double, and three bed private rooms. There are also four bed mixed dorms.